Facebook’s privacy conference call just ended, and it’s clear some major changes are going to be coming to the social network soon. Some of these, like a totally revamped privacy control page, are both long overdue and very welcome. But others, like the Transition Tool, seem ripe for disaster. Facebook clearly wants its users to become more comfortable sharing their content across the web, because that’s what needs to happen if the site is going to take Twitter head-on with real-time search capabilities. Unfortunately that’s far easier said than done for the social network, which has for years trumpeted its granular privacy settings as one of its greatest assets. Now, those settings are turning into problematic obstacles. 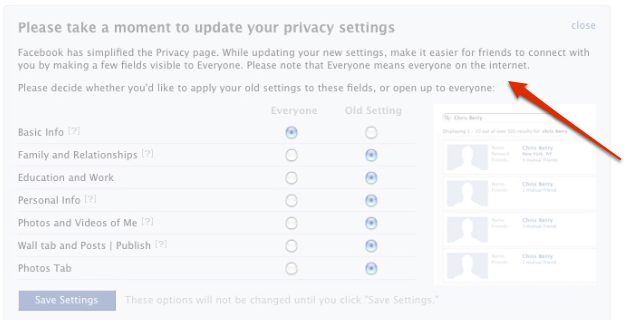 But Facebook sees its redesigned control panel as an opportunity to invite users to start shrugging off their privacy. So it’s piggybacking the new ‘Everyone’ feature on top of the Transition Tool, which is designed to help users acclimate themselves to the new settings. Facebook is planning to test out six different versions of the Transition Tool, and will probably settle on around two different versions for its general release (apparently different tools will be shown depending on your current settings). To get an idea of just how badly this might mess things up, one need only look at the wording for “Transition Tool 2”, which was shown to the press during the conference call (screenshot below). The tool’s heading invites users to update their privacy settings, which is fair enough given that they’re getting totally reworked. But it also says “While updating your new settings, make it easier for friends to connect with you by making a few fields visible to Everyone. Please note that Everyone means everyone on the Internet.” That may be intended as a suggestion, but it sure sounds like more of a command. And you can be sure that the millions of Facebook users who have no idea what the implications are of sharing their personal data with Google and the world will be happy to tick off those “Everyone” radio buttons. And that’s my real problem with all of this. Facebook has allowed users to share some of their information with ‘Everyone’ for a few months now, but those options have been nestled under Facebook’s privacy settings (most people probably didn’t even know it was there). Now these users are going to be seeing invitations front-and-center to share with everyone, and Facebook is telling them that this will somehow make it easier to connect with friends. Perhaps Facebook is confident that its users are smart enough to realize that sharing those drunken party photos with the world is a bad idea, but I’m not. Many of Facebook’s users are still in high school. Some are even younger than that (it isn’t hard to lie about your age on the Internet). And many of these people simply don’t understand that Google is forever. Just look at Facebook’s Vanity URLs for proof: Facebook made it very clear that these are permanent, which means that you’re going to be stuck with the same username five or ten years down the line. Yet there are still countless users grabbing names like ‘drunkdude’. That’s going to look great when your boss tries to add you as a friend. Fortunately Facebook seems to be preparing itself for the worst. 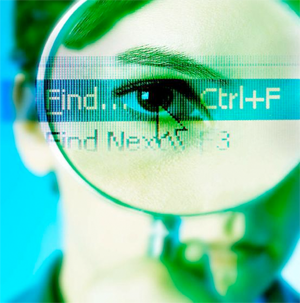 During the call, VP Communications Elliot Schrage noted that while Facebook is using a broad definition for “Everyone” right now — meaning the entire Internet — it isn’t going to actually start sharing the data with search engines immediately. Rather, it sounds like Facebook is going to keep these posts contained inside the social network at first, just in case users start over-sharing with reckless abandon (which they probably will). In any case, Facebook is going to achieve its biggest goals with these updates: people will soon be sharing far more with the web than they were previously, and the social network will be able to mount a substantial challenge against Twitter. Of course, this isn’t the way Facebook is positioning the changes. One of my favorite parts of the conference call was when ReadWriteWeb’s Marshall Kirkpatrick noted that Facebook was clearly looking to encourage users to open up their data to the public and asked for the social network’s motivations. Facebook’s response? It wants people to make their data public because it helps disambiguate users with similar names. My phone was muted at the time, but I was laughing heartily.